A comfortable, packable winter-ready pad with a highly realistic Realtree camo print, Klymit's Insulated Static V Realtree Camo delivers winter warmth and all season versatility. The body-mapped shape and V chamber design combine to maintain comfort and minimize air movement that can impact insulation, and dynamic side rails cradle you comfortably on your pad for a more restful sleep. A comfortable, packable winter-ready pad with a highly realistic Realtree camo print, Klymit &apos;s Insulated Static V Realtree Camo delivers winter warmth and all season versatility. The body-mapped shape and V chamber design combine to maintain comfort and minimize air movement that can impact insulation, and dynamic side rails cradle you comfortably on your pad for a more restful sleep. The chambers are filled with light, durable Klymalite™ synthetic insulation to add another layer of protection in winter conditions. Lightweight and packable enough for backcountry travel, it&apos;s also a comfortable choice for casual camping trips. 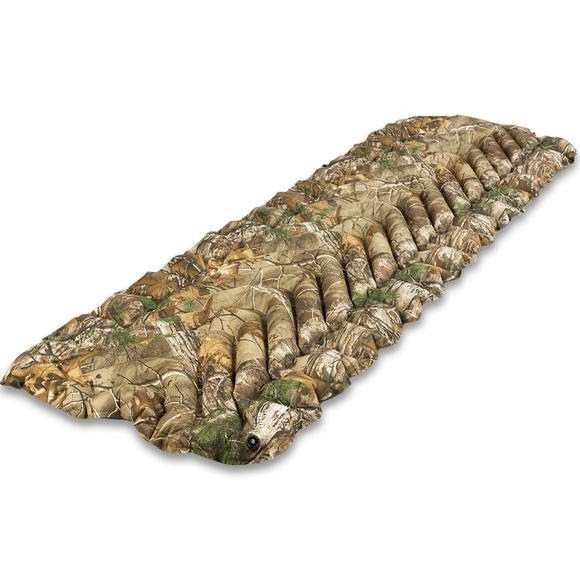 Advanced concealment pattern blends into the surrounding environment for backcountry hunting and minimal visual impact.